Today’s excerpt is from “Crash.” Lindy’s dad constantly checks on her and it’s driving her crazy, so she’s taken refuge in a local park, where she’s currently lying down daydreaming. She closed her eyes again, trying to clear her mind. She awoke in her tent, like she did most nights. The woman in the cot next to her snored softly. The base was generally quieter at night, quiet enough that she would’ve heard crickets if she’d been stateside, but instead she heard the quiet footsteps of soldiers on patrol, engines of occasional vehicles driving by, and the scream of a mortar tearing its way into their tent, into the woman snoring next to her. Lindy’s head cracked onto the pavement. She opened her eyes in the infirmary, battered and alive, mostly, and a medic wiped blood off her face with a smooth, wet rag. Lindy reached up to brush the medic away—her roommate needed the attention more than she did—and her hand connected with something furry. Her eyes flew open as she recoiled from whatever she’d touched. 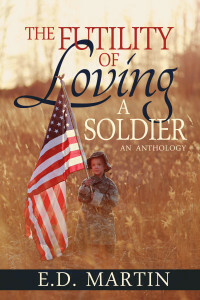 Read more about Lindy, and the other soldiers in this collection, by getting your copy at Amazon for just $2.99. Then post a link to your eight sentences blog entry, or join the fun at the Weekend Writing Warriors website. Very intimate snippet with sadness in every word. Well done, E.D. How sad for Lindy. I hope she will be OK. Intriguing excerpt. An intimate and emotional snippet. Great 8. I’m hoping whatever the furry thing she touch was – was a fluffy kitten and not something gross. Intense snippet! I wonder if it’s her father’s fears and memories that are invading her dreams- definitely makes me want to read more. Yikes! I wonder what the furry thing was. An animal? Looking forward to finding out.